Native Range: Eastern United States, but historically absent from the Cape Cod archipelago and associated islands. Table 1. States with nonindigenous occurrences, the earliest and latest observations in each state, and the tally and names of HUCs with observations†. Names and dates are hyperlinked to their relevant specimen records. The list of references for all nonindigenous occurrences of Lithobates catesbeianus are found here. Ecology: Found in lakes, ponds, cattle tanks, bogs, and sluggish portions of streams and rivers. Breeds in June and July producing 10,000 to 20,000 eggs. Tadpoles transform as quickly as 4 months in warmer climates and up to 3 years in colder locations. In colder climates, bullfrogs require year-round persistence of water for tadpoles to mature and over-winter. This species has been shown to be an alternative host to the glochidia of native unionid mussel Utterbackia imbecillis (Watters and O'Dee 1998). The home range of the L. catesbeianus has been estimated to be around 1.6 km (Copper 2017). Means of Introduction: The original mode of introduction was probably through accidental introduction with fish stocking; however, other means of introduction have also contributed to the spread of this species in the western states. Impact of Introduction: In Wellfleet, Lithobates catesbeiana is apparently expanding its population and out-competing the native Green Frog (Lithobates clamitans). Larvae can have a significant impact upon benthic algae, and thus perturb aquatic community structure. Where introduced populations have been studied in the Western U.S., adults consume birds, rodents, frogs, snakes, turtles, lizards, and bats. They are voracious eaters who will also prey on their own young. The introduced L. catesbeiana out-competes native amphibians in the modified portions of Trinity River, California (Fuller et al. 2011), indicating that habitat modification might aid in the establishment and spread of this species. Based on a study in western Washington, conservation of ephemeral wetlands will halt range expansions of bullfrogs. Permanently inundated wetlands are more likely to house nonindigenous species. Cooper, M. 2017. 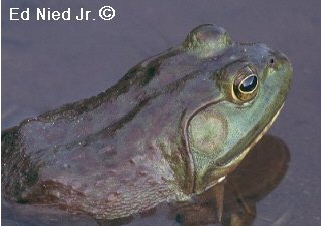 Movement, habitat, and home range of introduced bullfrogs (Lithobates Catesbeianus) on Mad River gravel ponds (Humboldt Co., Ca, USA), with implications for hydro-modification as a method of management. Humboldt State University. Watters, T.G. and S.H. O'Dee. 1998. Metamorphosis of freshwater mussel glochidia (Bivalvia: Unionidae) on amphibians and exotic fishes. Am. Midl. Nat. 139: 49-57.